Yanagi Sori combines Japanese and Western aesthetics with modern manufacturing techniques to create a harmonious image. He attended the Tokyo Art Academy from 1933 to 1938. He worked for the architects Junzo Sakakura in 1940, and from 1949 to 1942, he was assistant to Charlotte Perriand, who at the time had a commission to advise the Japanese Trade Ministry in Tokyo on arts and crafts. 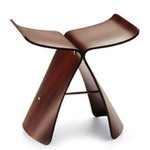 In 1954, Yanagi designed the famous Butterfly stool, whose delicate form recalls not only a butterfly, but also a Japanese character. 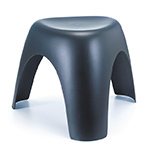 In the same year, he also designed the Elephant Stool. Both chairs were originally developed by the Japanese company Tendo Mokko, but are now manufactured by Vitra.